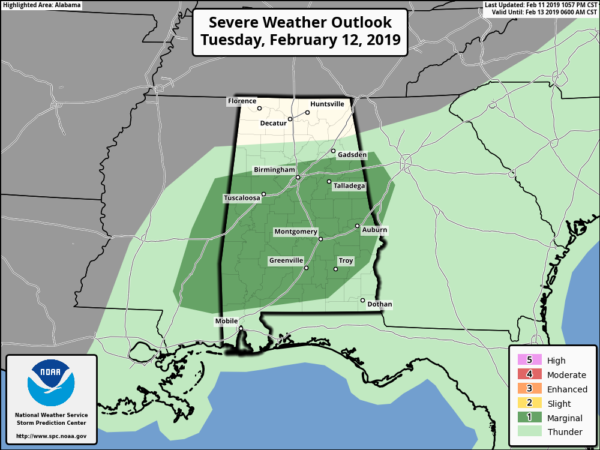 A few damaging wind gusts are possible from eastern Mississippi across Alabama and western Georgia today. An upper low will deepen across the Great Lakes with an upper trough extending southward across the central Gulf Coast states during the day. Meanwhile, a surface low will deepen as it pivots northeast from IL across southwest Ontario with a cold front extending south and progressing east across the Southeast. Weak instability ahead of the cold front may yield a few strong storms from MS into western GA, as wind profiles will be strong prior to frontal passage. Behind the front, cooler and drier air will quickly spread across the East, shunting instability and moisture offshore. A line of showers and a few thunderstorms will likely be ongoing Tuesday morning from MS into AL along a cold front. Lift will be strongest early in the day prior to the surface low lifting farther away from the region. Sufficient low-level moisture with 60s F dewpoints will support weak destabilization, but little to no heating is expected. CAMS suggest a fine line of forced convection along the advancing wind shift, which will likely surge ahead of the main cooling aloft. Surface-based instability will generally be weak owing to the marginally unstable boundary layer, and this may mitigate low-level rotation potential. A few damaging wind gusts are possible owing to the strength of the low-level wind fields, but widespread severe is unlikely.